Fifty years ago this month, Woods Hole received a visit from then Vice-President Hubert Humphrey. Humphrey, in his role as Chairman of the Marine Resources and Engineering Development Council, toured a number of ocean science institutions throughout the country, and on July 27, 1967, he arrived in Woods Hole for tours of U.S. Fisheries and the Marine Biological Laboratory before taking an overnight cruise to the Gulf of Maine on the Woods Hole Oceanographic Institution's research vessel, Atlantis II. While on board, Humphrey was given demonstrations of oceanographic instruments and equipment, and even participated in the release of some seabed drifters. Several years later, one of the drifters Humphrey released was returned to WHOI when it was found by a fishing vessel working out of Gloucester. 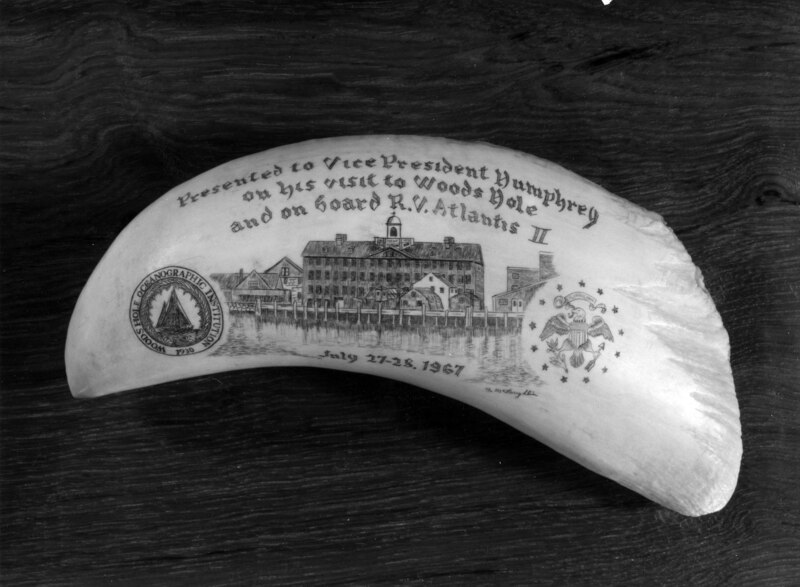 While in Woods Hole, Humphrey was presented with a gift of a piece of scrimshaw (pictured) created specifically for his visit by Barrett "Buzzy" McLaughlin. McLaughlin, Chief Engineer on the R/V Chain, taught himself the art of scrimshaw in an improvised work area on the desk in his cabin after he received some whale teeth from a sailor on a Russian whaling vessel while the Chain was in port in Beirut. Several pieces of McLaughlin's scrimshaw, as well as records related to Humphrey's visit, are held by the Data Library and Archives.